Workout should invariably form a part of your lifestyle. It is a great step towards healthy living. One should never avoid working out at any age or stage. Okay. So, that was the importance of workout. But one question that always wanders in our mind is what to eat before and after workout? 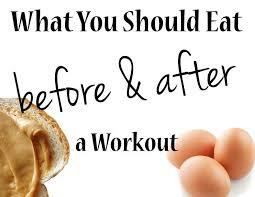 Most of us are unaware about the right way to eat before and after workout. Remember, eating too much or too little before workout has serious impacts on your health. So, you should know what and how much you should eat before workout. 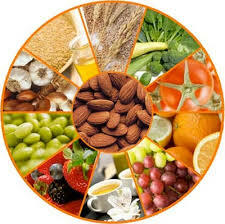 Before going for walk or any kind of cardio activity, it is important to fuel your system by eating something healthy. Drink a glass of milk which is a very good start to the day. Eat fruits which is a great way to keep your system fresh. You can also have energy drinks which help to energize your body. Carry a bottle containing water or even juice to gym or walk. It is very important to keep your system hydrated throughout your workout session. Whether you come back home after morning or evening workout, it is essential to fill your stomach with a healthy and nutritious diet. During workout, our body tends to lose important nutrients and minerals. To make up for this loss of nutrients, have a balanced diet containing cereals, pulses and grains in good quantity as they are excellent sources of proteins. Include egg whites in your diet. This will provide you with energy. Also, the body loses lot of salt in the form of sweat. So drink a glass of lemon water with a pinch of salt and pepper in it to make up for the lost salt. Try to include milk and other milk products like yoghurt and cheese as much as possible in the diet as they are great sources of Vitamin D.
Eat the right foods in the right proportion before and after workout and enjoy a healthy life! Reducing belly fat is one of the major fitness concerns of women. You tend to look fat if you have a bulge on your belly. Women can go to any extent to reduce their belly fat. Some even resort to artificial methods like tummy tuck therapy, drugs, injections, etc to achieve a flat tummy. But these methods prove to be harmful in the long run. What if I tell you that you can have a tummy tuck done naturally just by consuming some foods? Yes, you can! 1. Almonds : Yes, you read it right! Almonds help to slim your tummy by keeping it full. This anytime-anywhere snack will help you stay slim without overloading on calories. 2. Olive Oil : Olive oil is a monounsaturated fat. Consumption of olive oil in any form helps to keep your cholesterol under control and at the same time satisfies your hunger. 3. Eggs : Studies have proven that eggs help you to lose weight considerably. They contain Vitamin B12, which your body needs to metabolize fat. 4. Milk : Milk has extremely high amounts of calcium and calcium can play an important role in losing belly fat. Fat content in your body gets considerably reduced when you consume calcium-rich foods, thereby helping you lose weight. 5. Cherries : Yummy, isn’t it ? Cherries have melatonin, the sleep hormone. Melatonin is a powerful antioxidant which not only helps you to get good sleep, but also helps you to lose that extra flab on your tummy. Try out these amazing foods to lose weight and stay slim forever. Surya Namaskar or Sun Salutation is one of the best forms of yoga. It greatly helps in the process of mind healing and relaxes your body and soul. It has many benefits. If surya namaskar is practised religiously, it helps to combat many diseases. 1. As it is practised facing the Sun, surya namaskar helps the body to soak Vitamin D because sun rays are a vital source of Vitamin D.
2. Apart from improving your body postures, it also helps to remove excess and unwanted flab. 3. This asana stretches your muscles, thereby making them flexible and well-toned. 4. It helps to keep insomnia at bay because it calms and relaxes the mind and body. 5. Surya Namaskar effectively regulates menstrual cycles. 6. It helps to improve the functioning of the thyroid gland. You tend to gain weight if your thyroid gland is sluggish. 7. It also helps to improve your digestion by effective secretion of digestive enzymes. 8. Lastly, it greatly helps to improve your bowel movements. You can easily combat constipation and piles related problems if you do surya namaskar daily. Surya Namaskar is one such form of yoga which not only helps to lose weight but also combats many diseases by healing and calming your mind and soul. Begin your day with this amazing asana and see the results. Sodium is an essential electrolyte which is present in the extracellular fluid. It is very important for osmoregulation and fluid maintenance within the body. Sodium plays an important role in blood regulation and ensures that blood reaches every part of our body. Serious impairment of bodily function is caused due to absence of sodium. Sodium deficiencies can be extremely harmful. Reduction in the amount of sodium also decreases the fat accumulated in the peripheral parts of the body. Also, processed cheese, smoked fish, salty meats and pickles also contain ample amount of sodium. 1. Water Balance : Sodium helps to pump water into the cells thereby regulating the fluid levels in the body. 2. Proper Brain Function : This is one of the most important benefits of sodium. The brain is extremely sensitive to sodium levels. That’s why sodium deficiency often leads to confusion and lethargy. Sodium keeps the brain sharp and going which is necessary for its development. 3. 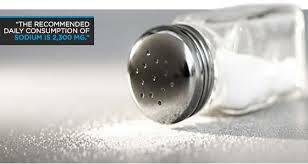 Elimination of excess Carbon Dioxide : Sodium helps to eliminate any excess carbon dioxide that has accumulated in the body. 4. Regulates Glucose Absorption : Sodium helps in good absorption of glucose by cells, thereby leading to smooth transportation in the body’s cell membranes. 5. Heart Health : Sodium maintains the blood pressure but excess intake of sodium might lead to high blood pressure. Sodium must be consumed according to body’s requirements. So we see that Sodium is very necessary for the regulation of cellular activity and proper functioning of the nervous system. Your body needs supplement doses of sodium more when you sweat profusely or have sunstroke. Loving yourself is no sin. And when you love yourself, loving your body and maintaining it automatically follows. You should take out enough time for any kind of cardio activity daily to maintain a healthy lifestyle. Investment in health is the best investment with maximum returns. Morning walk is the most effective solution to all problems. It helps to keep all diseases at bay and also helps to lose weight, of course! 1. It helps to boost your immunity and energy levels. Physical activity early in the morning is extremely helpful because it ensures greater mental sharpness throughout the day. 2. One of the most important reasons is that it helps reduce the risk of breast cancer as carcinogens do not stay in prolonged contact with the intestinal lining of the body. 3. Regular morning walks help to keep two prominent lifestyle diseases at bay – Diabetes and Hypertension. Walking burns glucose which in turn leads to better utilisation of insulin, thereby improving blood sugar levels and preventing diabetes. As far as hypertension is concerned, walking lowers high blood pressure levels and blood pressure controls helps against hypertension. Thus, walking just 20-30 minutes everyday helps to suppress both the diseases. 4. Daily morning walks ensure better muscular strength and endurance. It helps to tone the muscles of thighs, arms, forearms, buttocks and legs. 5. Last but not the least, weight loss! Any cardio is performed keeping this primary goal in mind. Morning walk burns calories and improves the metabolism of the body. You know, you can burn upto 100 kcal of energy every one mile you walk! Also, in the evening when blood glucose level is high, walking burns the glucose and reduce blood sugar level.